Several authors have described a 'stirrup' or fascial sling of the foot which affects the balance of the arches.1,2 This sling comprises two or three muscles (depending on which author you're reading) which are linked through fascial connections at the medial arch of the foot. These are the tibialis anterior (which crosses the ankle to attach to the medial cuneiform and the base of the 1st metatarsal joint) and the peroneus longus (which crosses under the foot to attach to the same region). Sometimes, the tibialis posterior muscle is also included, as it has a large attachment area on the plantar region of the foot and interacts with the above two muscles. In this post I will discuss the relationship of the tibialis anterior and tibialis posterior. These are part of the Stomach and Spleen sinew channels, respectively. They have a synergistic relationship, working together to lift the medial arch. 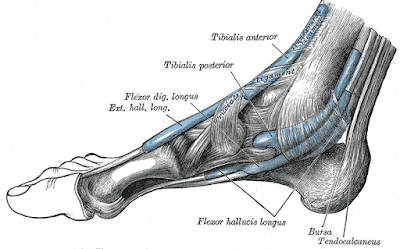 In the next post I will follow up and discuss the relationship of the tibialis anterior and peroneus longus. These have an antagonist relationship, and balance between them is crucial for proper balance among the arches of the feet. The tibialis anterior is part of the anterior crural (leg) compartment (Fig. 1). It attaches from the upper two thirds of the anterolateral tibia; crosses over the anterior ankle to the medial side and is held in place by the anterior ankle retinaculum; and then attaches to the medial cuneiform and base of the first metatarsal (Fig. 2). 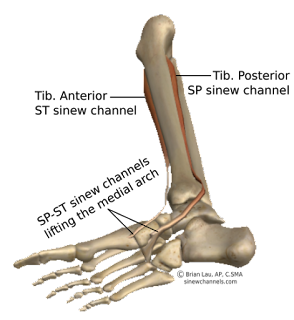 It performs dorsiflexion of the foot at the ankle, and it inverts the foot. 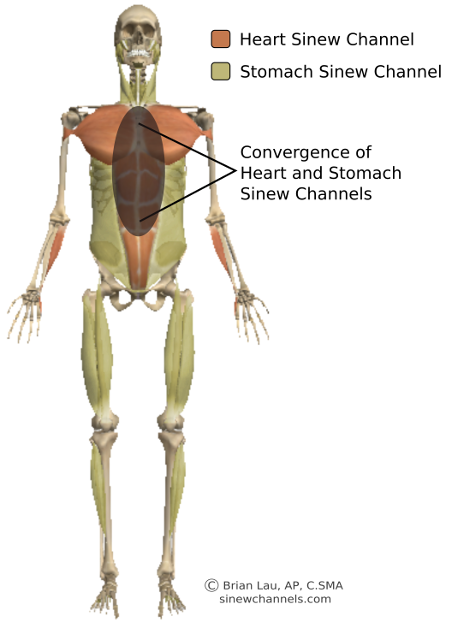 Both of these muscles are important as they lift and support the medial arch. They can frequently become inhibited and fail to adequately support and lift the medial arch. This synergistic nature is consistent with both the Spleen and Stomach primary channels and organs. Even the classical descriptions of these organs reflect this. It is worth remembering that in the description of the organs and their bureaucratic roles (which, for the classical physician, was a memory aid and a simple way to remember the functions of the organs), all of the organs had their own line in the Su Wen, with the exception of the Spleen and Stomach. The fact that these organs are discussed together reflects their synergistic nature in the body. I see that this is also reflected in the relationship between the sinew channels of these two networks. See the previous blog post about patellar balance of the Spleen and Stomach sinew channels for an exploration of how these channels work together to produce knee extension, but can be involved in imbalances which can affect patellar tracking. Clinically, both of these muscles can fail to adequately lift and support the medial arch, especially in impact sports such as running. A certain amount of pronation is normal as weight is born by the foot; it acts as a shock absorber. This occurs with a medial rotation of the tibia and a drop of the navicular bone. Problems occur when there is foot overpronation, as the movement become excessive and added stress occurs in the soft tissue structures of the foot and leg, with biomechanical changes occurring in the the foot, ankle, knees, hips and throughout the body.7 Common injuries can include plantar fasciitis/fasciosis and anterior or medial shin splints (also referred to as tibialis anterior syndrome and tibialis posterior syndrome). But foot overpronation can also be a contributing factor for knee injuries and hip injuries, as this condition often correlates with excessive knee valgus (knees moving in with weight bearing) and excessive elevation of the ilium with weight bearing. Local treatment involves specific local needling techniques to work with the fixed pain site .7,8 There will be different local techniques for plantar fasciitis, versus shin splints, versus something such as iliotibial band friction syndrome. Adjacent points can be selected to address the overactive and inhibited muscles; needling of the motor points can be used to address the foot overpronation or other imbalance of the foot. There are cautions for needling the tibialis posterior. It can be accessed through the Spleen channel, but the depth it takes to reach the motor point takes the needle very close to the tibial artery, and instruction of this specific needle technique is best left to a classroom. SP-6, however, reaches and influences the tibialis posterior at the region that it crosses in front of the flexor digitorum longus and becomes the most medial (and most accessible) muscle of the deep posterior compartment. Tibialis anterior, on the other hand, is simple, as its motor point is ST-36 (zusanli or leg three miles). Another motor point of tibialis anterior is the extrapoint lanweixue. The most reactive point can be selected for best results. I typically find ST-36 to be the most influential point to improve functionality of the tibialis anterior. Additional treatment thoughts will be discussed in the next post after discussing the peroneal muscles and their role in injury. 1. Myers, Thomas W. "The spiral line." Anatomy Trains: Myofascial Meridians for Manual and Movement Therapists. 3rd ed. Edinburgh: Churchill Livingstome, 2014. 132-149. Print. 2. Clemente, Carmine D. Anatomy: A Regional Atlas of the Human Body. Baltimore: Williams & Wilkins, 1997. 3. Lau, Brian. "Anatomy of the Sinew Channel: Lower Extremities." Module Four: The Lower Extremities Anatomy/Palpation/Cadaver Lab. Pacific College of Oriental Medicine, San Diego. 10 Sept. 2015. Lecture..
4. Lau, Brian, and Matt Callison. "Creating a Modern Model for the Assessment and Treatment of the Sinew Channels (Jingjin): Part 1." Oriental Medicine Newspaper (June 2016): 7; 33. Print. 5. Callison, Matt, and Brian Lau. "Anatomy of the Sinew Channels (Jingjin)." Pacific Symposium. Catamaran Resort Hotel, San Diego. 29 Oct. 2016. Lecture. 6. Wang, Ju-Yi, and Jason D. Robertson. "The tai yin (greater yin) system." Applied Channel Theory in Chinese Medicine: Wang Ju-Yi's Lectures on Channel Therapeutics. Seattle: Eastland Press, 2008. 64-76. Print. 7. Callison, Matt. An Acupuncturist's Guide to the Treatment and Assessment of Plantar Fasciitis and Excessive Foot Pronation. Sports Medicine Acupuncture: Resources. Sports Medicine Acupuncture. Web. 8. Callison, Matt. "Acupuncture & Tibial Stress Syndrome (Shin Splints)." Journal of Chinese Medincine 70 (2002): n. pag. Web. All of the primary channels along with the Du and Ren vessels have luo-connecting points, which are where the luo-connecting channels branch off of the primary channels. In addition to these luo-connecting channels, the Stomach and the Spleen channels each also contain a great luo-connecting channel. The Spleen great luo-connecting channel is the more widely discussed in acupuncture texts, but is still a bit mysterious in its own right. I will discuss this in another post. The Stomach great luo-connecting channel (xu li) is infrequently discussed in acupuncture texts and, possibly has even more mystery associated with it. Great Luo of Stomach Emptied: Palpitations, fibrillations, tachycardia. Why would this secondary channel of the Stomach network cause palpitations of the heart? We can gain a more precise understanding by exploring the anatomy of the stomach and the heart, their topography in the body, and the way in which dysfunction of the upper portion of the stomach can contribute to the above symptoms. 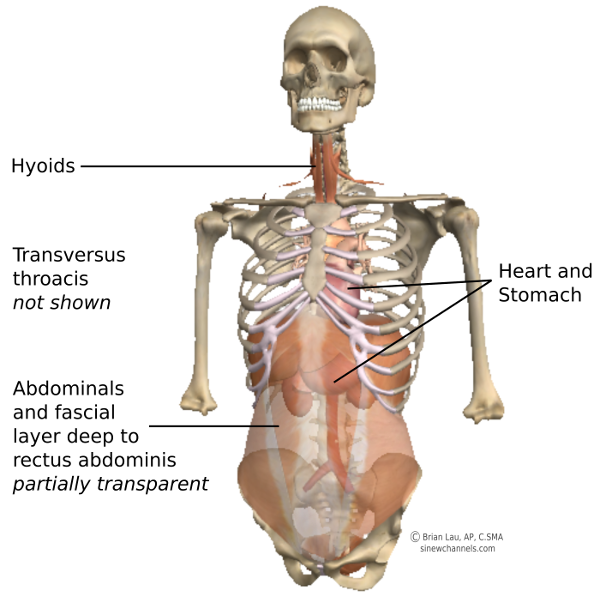 Looking at the topography first, one sees that the upper portion of the stomach is in close proximity to the heart. 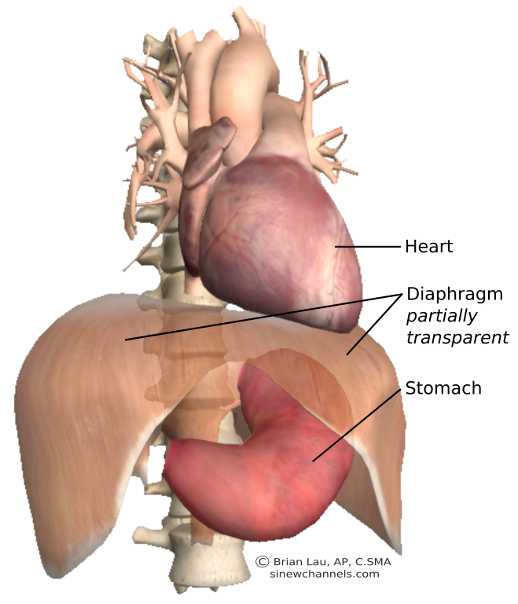 In fact, the upper portion of the stomach is called the cardia due to its close proximity to the heart, as it is essentially just on the other side of the diaphragm (Fig. 1). While many organs are close to each other, the research about to be published by an osteopath in Italy named A.J de Koning helps illustrate the link between these two organs. De Koning is coordinating with an Italian cardiologist, Dr. Stefano Bianchi, who regularly performs cardiac ablation for irregular heart beat due to atrial fibrillation (AFib). A.J. de Koning is a visceral manipulation practitioner and teaches with the Barral Institute. Dr. Bianchi invited de Koning to work with him and has him evaluate the patients first using osteopathic 'listening' techniques to feel for dysfunction. When applicable, visceral manipulation techniques are performed, and the result has been a greatly reduced necessity for ablation procedures. In particular, visceral manipulation techniques for the stomach have been particularly beneficial. Many of these patients with atrial fibrillation who benefit from visceral manipulation applied to the stomach have a history of gastric problems such as gastritis. Here is a summary of de Koning's research, which is available on the International Alliance of Healthcare Educators website. In addition, Dr. Wang likens PC-6, a point that is frequently used for stomach conditions such as gastritis and stomach spasms in addition to heart conditions such as angina, to the parasympathetic nervous system. Jueyin closes inward and is the most yin aspect of the six divisions, describing a physiology that reflects the parasympathetic nervous system regulation. It is worth remembering that 90% of the parasympathetic nervous system is innervated by the vagus nerve. So, in effect, this point combination can be viewed as having a regulatory effect similar to de Koning's description. It can be especially useful when this link occurs between dysfunction in the Stomach affecting the Heart (history of gastitis, ulcers, acid reflux, etc, might serve as clues) as opposed to dysfunction which comes from problems with the Heart directly and might better be treated with the Heart collateral point, HE-5. In addition to this point pair, the acupuncturist can consider treating joint fixations in the thoracic spine using huatuojiaji points and tuina mobilizations.6 These fixations could manifest anywhere in the thoracic spine, and it would not be surprising to find them in the region of the back-shu of the heart, the stomach, or both. Assessment and treatment of the sinew channels can also be useful for these types of arrythmias; especially assessing for dysfunction in the region of the convergence of the Stomach and Heart sinew channels (Fig. 3). Both of these channels include the rectus abdominis and rectus fascia. This would cover the region of the front-mu points of the Stomach and the Heart, but it would also include the area under the abdominal portion of the pectoralis major which extends all the way to rib 5. Myofascial release and/or motor point and trigger point work to this region allows more space and freedom on the outside and will reinforce any internal work performed with acupuncture, visceral manipulation, or other techniques that are addressing the zangfu. 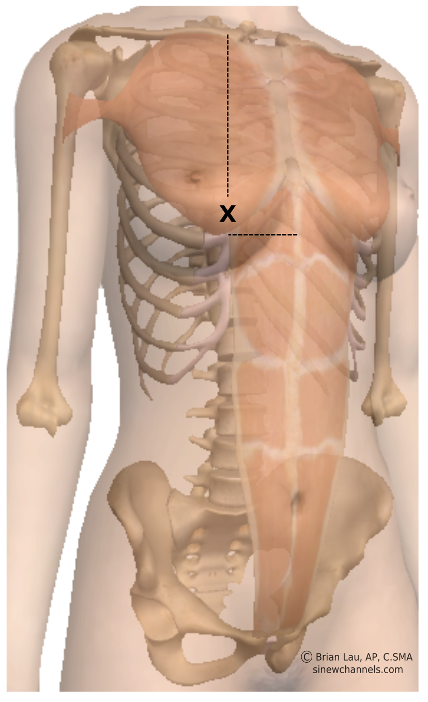 border of the xiphoid process. One final thought: Dr. Janet Travell, in her book Myofascial Pain and Dysfunction: The Trigger Point Manual, mentions a pectoralis major trigger point (TrP) which can develop on the right side in the 5th intercostal space and can contribute to arrhythmia of the heart (Fig. 4). Travell suggests that this TrP might be in the intercostals rather than the pectoralis major.7 I think it is also possible that this TrP is in the superior rectus abdominis attachments. Either way, it is at the area where the rectus abdominis meets the pectoralis major, or, to put it another way, where the Stomach and Heart sinew channels converge. 1. Focks, Claudia, Ulrich März, Ingolf Hosbach, and Johanna Schuster. "Acupuncture points of the twelve primary channels." Atlas of Acupuncture. Edinburgh: Churchill Livingstone/Elsevier, 2008. 125. Print. 2. Maciocia, Giovanni. "Identification of patterns according to the 12 channels." The Foundations of Chinese Medicine: A Comprehensive Text for Acupuncturists and Herbalists. Edinburgh: Elsevier Churchill Livingstone, 2005. 751-55. Print. 3. Cecil-Sterman, Ann, and Pat Didner. "The luo channels." Advanced Acupuncture: A Clinic Manual. New York: Classical Wellness Press, 2012. 49-128. Print. 4. "Atrila fibrillation, the stomach and visceral manipulation." International Alliance of Healthcare Educators. N.p., n.d. Web. 28 Dec. 2016. <http://www.iahe.com/images/pdf/Atrial_Fibrillation-AJ_de_Koning_Research.pdf>. 5. Wang, Ju-Yi, and Jason D. Robertson. "The source, cleft, and collateral points." Applied Channel Theory in Chinese Medicine: Wang Ju-Yi's lectures on channel therapeutics. Seattle: Eastland Press, 2008. 513-15. Print. 6. Lau, Brian. "The sinew channels & vertebral fixations." The Illinois Acupuncturist 1 (Mar. 2016): 24-27. Print. 7. Simons DG, Travell JG, Simons LS. Travell and Simons' Myofascial Pain and Dysfunction: The Trigger Point Manual, Volume 1, Upper Half of Body. 2nd ed. Baltimore: Williams & Wilkins; 1999. p.821-2, 829-30. 8. Simons, David G. “Cardiology and Myofascial Trigger Points: Janet G. Travell’s Contribution.” Texas Heart Institute Journal 30.1 (2003): 3–7. Print.